Feeling powerless to change the things and situations we encounter in life is far too common. When it seems difficult to lose weight or drop a bad habit, what we forget all too often is that those who have managed to do so have achieved this through effort, hard work, and specific strategies, and not just through mere talent. In other words, few people are “naturally thin”, and fewer still are “born smart and talented”. The truth is, often, we alone stand in the path of our success because of our fixed perception of things. Science suggests that success is not determined by intelligence, innate ability or talent. It turns out that how you look at the world and perceive the concept of “hard” says much about what Carole Dweck refers to as a growth mindset. Much has been said about the power of a growth mindset ever since Dweck published her studies decades ago. Working with other researchers, she found that while some children had a very difficult time dealing with even the most insignificant mistakes and failure, others were able to more easily overcome setbacks. Other researchers who have focused on the concept of the growth mindset have found largely similar results. They have found that poor performance is not synonymous with poor ability. It must be said, however, that a few studies have failed to find a relationship between one’s mindset and one’s behavior. That said, most of the neuroscience research on growth mindset suggests that it is possible to shift from a fixed mindset to a growth mindset, and that a growth mindset increases motivation, perseverance when faced with setbacks, creativity, independence and achievement. Put differently, researchers working on the growth mindset have found that the brain is plastic, and it can therefore be made stronger through specific actions. What this means is that our beliefs largely affect our behavior, but that working on those beliefs can help change that behavior. Briefly put, a growth mindset is the power of believing you can improve. The opposite, a fixed mindset, is the perception of things that happen in our lives as fixed and unchangeable. As Henry Ford eloquently put it: “whether you think you can, or you think you can’t – you’re right”. We now know that “growth mindset parenting” can help transform how children view their performance and what they learn from what they perceive as difficult situations or failures. 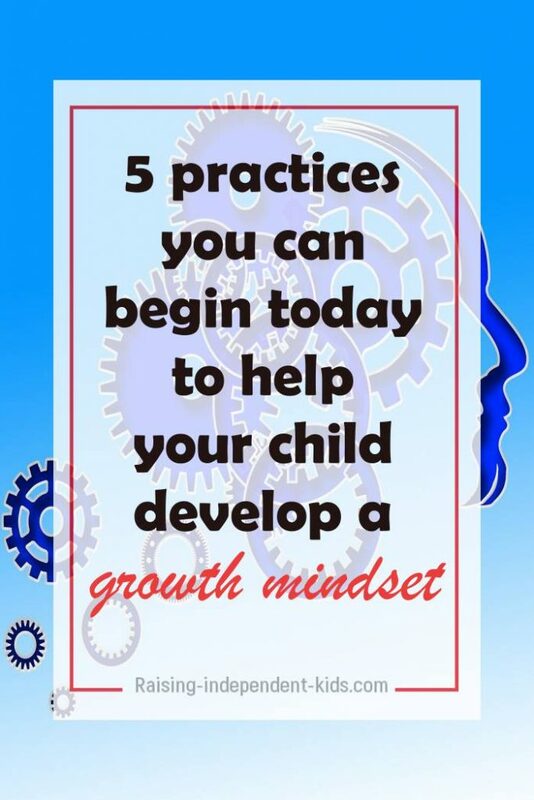 Here are 5 things to keep in mind to help your child develop a growth mindset. One of the most important things the studies on growth mindset have taught us is that the feedback we give our children largely affects their behavior. In other words, the langue we use can either work toward or against the development of a growth mindset. Dweck, for instance, showed that focusing on your child (“how clever you are”) instead of his/her behavior (“see how your efforts have paid off”) could be counterproductive. Makes perfect sense if you think about it: if you tell your child she is “clever” because of good performance, does that means she is “not clever” or “less clever” when she has slightly poorer performance? 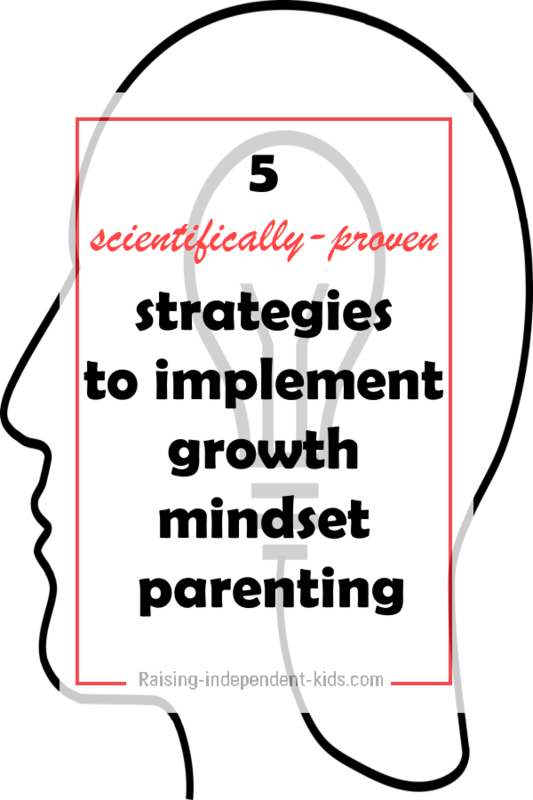 Most of the studies around fixed and growth mindsets have come to the same conclusion: praising behavior, and not your child, leads to the development of a growth mindset. Using appropriate words can help your child view performance as a product of effort and strategic thinking rather than as an issue of “talent” and “innate abilities”. It has been said that you cannot fail if you learn from defeat. Growth mindset studies suggest that how you teach your child to react to failure determines whether he will develop a fixed or a growth mindset. 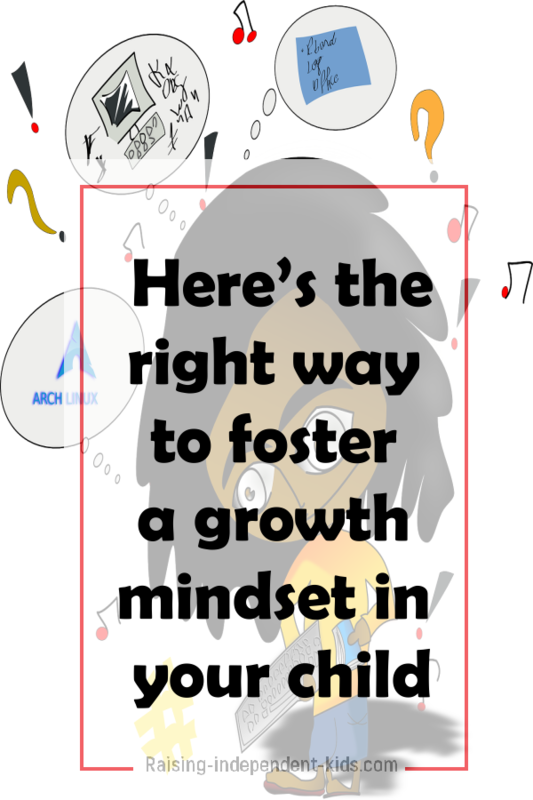 Remember that there are resources to help both you and your child adopt a more “growth mindset-oriented” approach. Help your child identify his strengths – it is easier to develop a growth mindset when he feels and knows that he is capable of success. That said, a child who believes he has mastered something is likely to get bored instead of seeking greater challenges so it is important to provide an environment (for instance, by proposing lessons to learn new skills in his area of interest/proposing more challenging activities that build on what he has already learned, etc.) to keep him from losing interest. Help your child identify the areas in which he has a fixed mindset. It is impossible to work toward the development of a growth mindset if he does not know what he needs to work on. Teach your child to focus on the future – what will I do next time – rather than on the past. Remember that small, repeated actions will get you the best results. 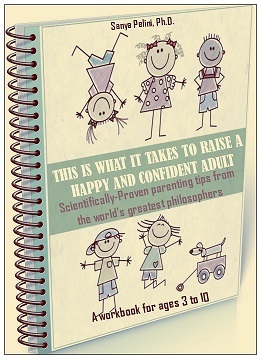 The This is what it takes to raise a happy and confident adult workbook is filled with practical worksheets, resources, and strategies to help your child learn to view failure and mistakes as a normal learning process and to help you easily set up a strength-based parenting program that will help your child develop a growth mindset. 3 | Smile, someone’s watching! Be attentive to your behavior. How do you react to difficult situations? Do you shy away from things you think you lack mastery or try different ways of dealing with hard situations? Honestly identify the areas in which you have a fixed mindset. Be honest about how you react to your child’s behavior. Does it help him develop a growth mindset or keep him within a fixed mindset framework? Be honest about how you view success – effort or talent? Remember that your fixed mindset – or your growth mindset – is reflected in your everyday behavior. When you let your partner always do a particular task because you “just cannot get the hang of it”, you are conveying a fixed mindset. When you see your colleague as “naturally smart and competent”, you are conveying a fixed mindset. Be willing to get out of your comfort zone and put in the effort required to get you where you want to be. Not only will it be good for you, it will also be a good example for your child. Incorporate a “growth mindset routine” into your child’s everyday life. For instance, choose a day (for instance once a day or once a week) where family members can talk about the mistakes they made and what they learned from them. Evidence suggests that “autonomy granting”, i.e., encouraging your child to participate in decision-making fosters independence and creative thinking skills. Your child’s ability to make sound decisions increases between the ages of eight/nine and 13, and he/she gains decision autonomy (i.e., the ability to make decisions without parental involvement) between the ages of 12 and 17. Autonomy granting helps teach your child to make decisions by himself, and this is necessary to help him develop a growth mentality. Make it a habit to encourage your child to ask questions: How will you achieve this? What do you think? What do you think we can change? What would you change? Your child’s physical and emotional wellbeing significantly impact her behavior. Her diet can affect her behavior, and even issues like poor sleep habits can influence how she performs on tasks, both in school and at home. Be attentive to the surprising things that may influence your child’s behavior. Remember, also, that your child’s inability to deal with difficult emotions such as anger and anxiety have an impact on her behavior and can affect her social, psychological and academic development. If you’d like practical and applicable strategies to help your child develop a growth mindset, the This is what it takes to raise a happy and confident adult workbook proposes multiple resources you can start using from today. Check it out here.